The reddish-brown crust that often forms on iron and steel objects comes from changes that take place in the outer surface of the metal itself. This crust, called rust, is caused by the mixture of the metal with oxygen from water in the air. When moisture from the air, or from anywhere else, reaches an object with iron in it, oxygen in the water combines with atoms of iron to form molecules of a compound called iron oxide. The iron oxide particles remain suspended in the water, but when the water evaporates, the particles remain, forming a reddish coating on the surface of the iron. Without the presence of water, objects cannot rust. Other metals besides iron and steel can rust when exposed to moisture, but not all rust is “rust-colored.” For instance, when copper or bronze rusts, it turns green. The green crust is called a patina. Where Does Rust Come From and Why Does Metal Rust? Why Does Silver Tarnish, What Causes it, and What Is the Difference Between Tarnish and Rust? 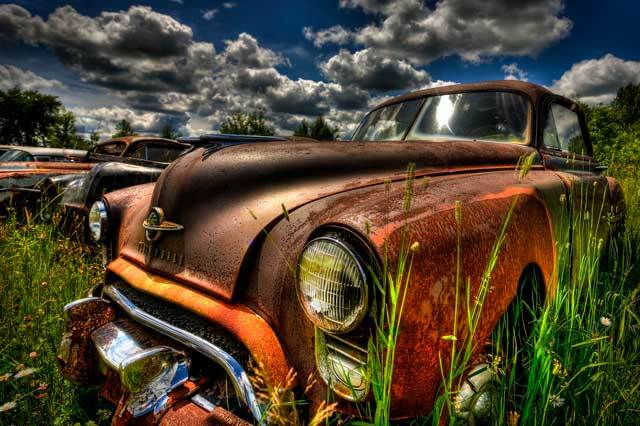 Why Does Salt Make Cars Rust Faster?